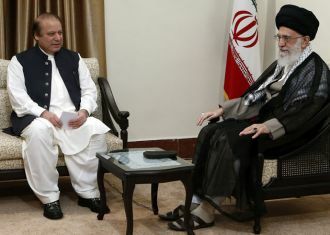 JNN 14 May 2014 TEHRAN – Supreme Leader of the Islamic Revolution Ayatollah Seyyed Ali Khamenei has expressed dissatisfaction over the level of economic ties between Iran and Pakistan, calling for measures to enhance bilateral relations. The Leader made the remarks during a meeting with Pakistani Prime Minister Nawaz Sharif in Tehran on Monday. The Leader also noted that there are certain countries that are making efforts to deliberately cause insecurity along Iran-Pakistan border. “There are hands at work to create division between the two friendly and sincere people of Iran and Pakistan through different methods including causing insecurity along the long common border,” Ayatollah Khamenei stated. Ayatollah Khamenei also said except the United States there are other countries which are trying to create division between Tehran and Islamabad. Ayatollah Khamenei went on to say that great cultural and religious affinities between the Iranian and Pakistani people have helped the two countries improve their bilateral ties. The Pakistani prime minister, for his part, expressed regret over the recent incident in the border areas in which five Iranian guards were kidnapped and transferred to Pakistan, saying the Pakistani government will do its utmost efforts to counter elements behind such incidents and will welcome Iran’s measures over the issue. The prime minister also said his government will use all his efforts to promote the value of economic ties between the two countries to the previous figure of 3 billion dollars per year and even beyond that. Heading a high-ranking delegation, Sharif arrived in Tehran on Sunday for an official two-day visit and held talks with senior Iranian officials. The chairman of Iran’s Expediency Council, Ayatollah Akbar Hashemi Rafsanjani, has said that Iran and Saudi Arabia are the most important countries in the struggle to eradicate the sectarianism dividing Shia and Sunni Muslims. Rafsanjani made the remarks during a meeting with Pakistani Prime Minister Nawaz Sharif in Tehran on Sunday. Commenting on the relations between Iran and regional Arab countries, he said that Iran and Saudi Arabia both have an important status in the region. Rafsanjani added that other Islamic countries in the region should cooperate to fight against the actions taken to create a rift among Muslims. Commenting on the problems caused by the Taliban in Afghanistan, he said that Iran and Pakistan are duty-bound to cooperate in preventing another civil war in Afghanistan. Elsewhere in his remarks, Rafsanjani said that Iran and Pakistan should use all of their affinities and potential to expand their ties. Nawaz Sharif said that there is great potential for Iran and Pakistan to expand their economic and industrial relations. He went on to say that cooperation between Islamic countries is necessary in the current situation in the region and the world. Through cooperation between Islamic countries, regional problems will be resolved and peace will be promoted, he added. The Pakistani prime minister arrived in Tehran on Sunday with an economic-political delegation. During his visit, he met with Supreme Leader Seyyed Ali Khamenei, President Hassan Rouhani, and First Vice President Eshaq Jahangiri. This entry was posted in Iran News, Middle East, Pakistan News and tagged Ideology, Irani supreme Leader, Khamenai, Pakistani PM Nawaz Shariff, takfiri. Bookmark the permalink.